In addition to providing assistance building churches in Uganda, some ministers have received help with transportation needs as they minister to their local flocks. Receive Christian greetings from Pastor Charles Siminyu of Bugiri Church in Uganda. Thank you for the work of the Lord as you diligently serve Him in USA and other parts of the world. I hope this email finds you in good health and all the saints of God in your area. Thank you my precious brother for the help you have rendered unto me through my fellow soldier of the Cross Pastor Moses Swaga of Bulongo Church. I was able to buy the motorcycle. Find attached photo of the Motorcycle. The question of transport is now solved for me as I too serve the Lord. Thank you very much for buying me a bicycle which will help me much in Gods service through pastor Swaga Moses. Thank you very much,let the almighty reward you bountifully. 1 . 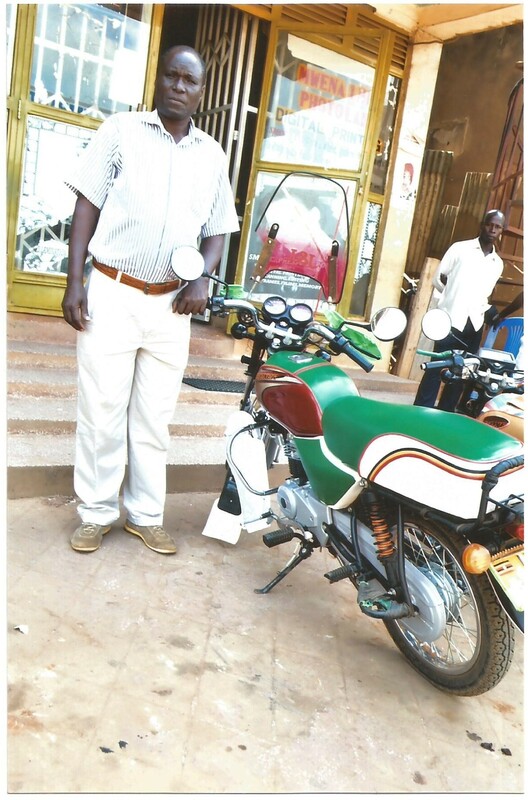 Brother Jeremaya Pilso of Namanoga Church, Kayunga District. 2 . Brother Adida Charles of End Time Message Church Kalagi, Mukono District. 3 . Brother Miracle of Word power Tabernacle Kigombya, Mukono District. 4 . Brother Harbert of End Time Message Bukunja, Buikwe District. N.B Those already with email Address, they write direct to you and the ones without email address, they sign on the acknowledgement form.